Yeah, right. A story about ‘sleeping’ for hundreds of years teaches Muslims about productivity?! Well, let’s recap the events together, shall we? A number of young men are guided to believe in the One and Only Lord and because they lived in a city of disbelievers they decide to escape to the cave, fearing execution after calling people to monotheism. Allah makes the boys fall asleep for 309 years (300 solar and 9 lunar years), and then they wake up to a new society filled with faith. It’s a miracle and it’s amazing but hey, as far as the story goes, that is it! We learn so many lessons from it but ‘productivity’ isn’t one of them, since the boys were actually sleeping! Isn’t that what some people would think? Actually, there is more to this story than that, and that’s what we’ll explore in this article. Roughly explained, productivity is the ability to efficiently yield positive and useful results in an allotted amount of time. We tend to relate this aptitude to grown-ups. We don’t really expect the younger generation to naturally be productive, unless we actually pin them down to the floor and make them do something useful with their time. We have this connotation in our heads that teenagers are up to no good. That’s the age where they go wild and get together to ‘live it up’ before real responsibilities kick in, and even though we parents try to restrain them, somehow deep inside we think that it’s okay to cut them some slack. I mean, they’re teenagers, their hormones are literally holding their brains hostages! The sleepers of the cave were also youngsters, and Allah specified that explicitly in the Holy Qur’an. They lived in a city with no rules and there’s no mention of any strict parents with unwavering curfews, is there? Imagine what boys their age would get together to do? They didn’t live in a fairytale; they lived in a real corrupt environment abound with fitna, from inadequately dressed women to parties and alcohol. But instead they chose to get together in the remembrance of Allah . They used their time wisely, learning their religion and planning on how to spread the true word of Allah . Now that’s a bunch of truly productive youngsters! The boys were an integral part of the community up until their lives were in danger. They never fled the scene just because they were different. They invested in themselves and had a clear-cut mission of reviving their immoral society. It makes me wonder about the stories we hear today: girls taking off their hijab because they couldn’t ‘fit in’, and boys drinking alcohol and smoking because otherwise they won’t be ‘cool’! The wannabes of today have no mission and no goals and that’s not Islam. We are a unique ummah because we have an obligation to benefit ourselves and others, and we have an ‘end’ in mind, which is Jannah, In sha Allah. Yes, we want to be successful and wealthy and popular, but we don’t stop there like others do. Stand up and remember who you are! A true Muslim is a leader, someone who can make a change in this world and isn’t selfish or scared or embarrassed of his or her identity. There’s no time for free time, people! If these youngsters could do it, so can we! Get up, start working, learning and teaching and always keep your eyes on the ultimate goal: pleasing Allah . Lesson Three: Dead Ends Don’t Exist! We tried, it didn’t work, no one is listening so that’s it. Who is up for a steamy game of PlayStation? You bet they were still on their mission to ‘succeed’! The threat of death didn’t deter them. These young men were smart! They decided to proceed with caution, so as not to blow their covers. Having faith in Allah and a goal of pleasing Him are the first steps, but an essential part of being productive is to calculate the risks and never quit. So were the boys wearing shoes or sandals? What was their dog’s name? How many were they exactly? What difference does it make? How will these questions help you reach your goal more efficiently? Focus on what’s important and don’t distract yourself with minute details that Allah did not bother mentioning! Instead, He dedicated a whole verse to people’s speculations about the real number of the sleepers, whether they were 3 or 5 or 7, and guess what? He never gives an answer because it doesn’t matter. That’s not the point of the story! You want to be productive? Stop ‘guessing the unknown’, for it will be like trying to hit a target when you can’t even see it. Distractions will only blind you from hitting the real target, and in this story, that’s learning how to guard your faith against all odds. Allah honored the sleepers by mentioning them in the Qur’an and for us to be reminded every Friday of how they guarded their faith. Prophet Muhammad said this chapter protects us from the ultimate trial of the Dajjal (the Anti-Christ) who will come with four challenges; one of them is testing our faith. Hey, wait a second, what about the other three? You have exceeded your word limit for this article. This an automated message. 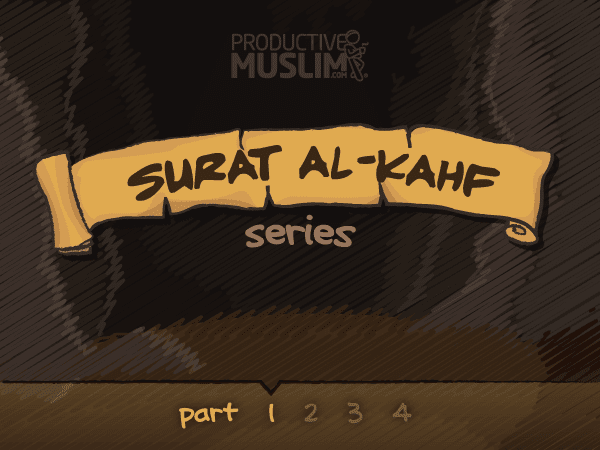 Stay tuned for the remaining three parts of this series on ProductiveMuslim, and let us hear your thoughts and reflections on this story from the amazing Surat Al-Kahf!